What do you get when you combine a world-renowned economist and a food lover? A must-read book that uses economic principles to create new rules for foodies. 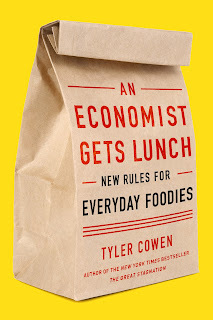 The book, An Economist Gets Lunch: New Rules for Everyday Foodies, is from Tyler Cowen, a leading economist at George Mason University. He writes a column for the New York Times and his economic blog, Marginal Revolution, is one of the most influential in the world. If you're interested in finance or economics like me, be sure to check out his work. Cowen is also a passionate foodie on the hunt for great food globally, which you can follow at Tyler Cowen’s Ethnic Dining Guide. I highly recommend reading this book. You’ll gain a greater understanding for our food system through the intersection of food and economics. What I found most interesting were all the tidbits about finding great food when traveling and creating memorable food experiences. Let me know what you think if you read the book. Knowing many of you might just prefer a Cliffs Notes version, here are the 29 best things I learned about food after reading the book. Do me a small favor for my efforts. Click here to Tweet or share this post. Better yet sign up for our future posts. 1) An Economist Gets Lunch in a nutshell. The book is about how to find great food, create better eating experiences, understand quality food experiences and feed nine billion people effectively. 2) Skip the concierge. When you’re in a new place, do not ask the hotel concierge for help because they have preconceived notions about who you are and what you want. Instead, ask a local where he/she eats - cab drivers are great because they stop for quick meals all the time. Cowen tells the story of finding an excellent quesillo stand in Nicaragua using this method. 3) Find competition. If you can’t get a recommendation, search for multiple restaurants close to each other that serve similar things. Competition is a sign of good food because bad places go out of business. 4) Eating fish in emerging countries. Where donkey carts are common and women carry baskets on their heads, eat your fish by the ocean or lake. Proper refrigeration is lacking in poorer countries,which limits the ability to transport food. Eat fresh! 5) Cheap food is not bad food. We confuse cheap food with unrewarding junk food. Not true. You can find excellent cheap food at food stands or crowded markets. 6) The food economic principle. Food is a product of economic supply/demand. Try to figure out where the supplies are fresh, the suppliers are creative and the demanders (consumers) are informed. 7) Blame World War II for bad food. The blame for bad food is most often assigned to the commercialization of food and the movement away from local. Cowen says this is partly true, but it ignores WWII’s push for high volume, low quality food during a time of rationing. Further, our eating habits struggled to adapt to demands of two income households, which led to food of convenience rather than food of quality. 8) Immigration equals great food. The demise of food in the U.S. also follows immigration restriction from the 1920s to the 1970s. When immigration from Asian and Hispanic countries was eased, the food boom began as more of us were introduced to new flavors and meals. 9) Climbing the supermarket Great Wall. Most Americans are lost in an ethnic supermarket because we are creatures of habit. Conversely, Cowen found some of his Chinese students could not navigate a U.S. supermarket, especially the cereal aisle. His solution is to try shopping at an ethnic supermarket for one month. It will be difficult, but you’ll broaden your food expertise. 10) How to find an authentic and cheap Thai restaurant. Since immigrants often look for the cheapest rent, Cowen suggests finding a family that owns a motel and operates a family restaurant on the side. Because they do not have to appeal to large numbers to pay rent, the food is cheap and authentic. Skip Thai restaurants with large bars and those serving a lot of drinks. And never eat at a Thai place that serves sushi. 11) What to eat in London. Skip the fish and chips (the best are actually in New Zealand according to Cowen). London has some of the best Pakistani, Bangladeshi and Indian restaurants in the world. Head to North London for the best of the best. (Note: we 100% agree with this. Try either Tayyabs or Lahore Kebab House). 12) The best tacos in Maryland. Cowen raves about R&R Tacqueria, located in a Shell gas station off route 95 in Maryland. The owner is a former airplane pilot from Mexico who makes some of the best authentic Mexican food he has found anywhere. 13) The strip mall creed. Look for ethnic food in strip malls without a well-known chain such as Wal-Mart. Because such locations have low rent, the owners can focus on great food of their culture rather than appealing to the masses. 14) What's best? Waiters are incentivized to push dishes with the highest profit margin or that are most expensive. Therefore, never ask “What should I get?” Instead, be an informed consumer and ask “What’s best?” A good waiter will list one, maybe two, items. 15) Eat what the locals eat. If you’re not sure what to order in another country or in an ethnic restaurant, look to see what the locals ordered and ask for the same. 16) Buy frozen, not fresh. Unless it’s locally grown, frozen food is fresher than raw fruits and vegetables. Frozen food is often immediately frozen after picked. Who knows how long "fresh" produce took to get from the farm to the store. 17) Understanding loss leaders. Every restaurant or supermarket has a loss leader to get you in the door to buy more things. At most Chinese markets, greens are the loss leader, which is why they’re cheaper than in American markets. 18) Why hospital food is bad. Are hospitals in business for healthcare or to make great food? It’s little wonder why hospital food is terrible then – their incentive is not to make great food. When searching for food, search for places with an incentive to make great food. 19) Where to find great BBQ. Cowen says the best BBQ places open early in the morning and are in towns with less than 50,000 people. BBQ is ideally suited for professional amateurs who concoct their own special sauces and serve a limited number of customers. 20) Mexican BBQ rocks. The San Agustin Oapan region in Mexico serves some of the best open pit BBQ in the world. Cowen recommends a place called Cucina Economica Lupita in the town of San Juan del Rio. 21) Utilize Vietnamese condiments. Try all the condiments when eating at a Vietnamese restaurant. If you're not sure which one to use ask the host or go with an all-everything sauce called nuroc mam mam pha. 23) Chef vs diner. Economics dictates that the quality of the customer matters more than the quality of the chef. Informed customers force chefs to be great, not vice versa. 23) Reducing your carbon footprint. The buy local movement is not as green as many think because the carbon costs associated with travel outweigh the benefits, even when local. A more effective strategy is to eat less red meat and processed food high in sugar. 24) Get away from the city center. If you can’t spot a famous landmark it’s probably a good food location. City centers are tourist traps in most cities, most notably in Italy. 25) Learn to love Mexico. Cowen raves about the food in Mexico. He claims it’s because Mexico has just the just the right level industrial food production with still-intact artisanal roots to create excellent food. (And yes, Mexicans use corn tortillas over flour). 26) Think food stalls in Singapore. The so-called hawker centers in Singapore have amazing food. 27) Finding food in Japan. Japan has great food, but it's not an easy city to navigate. A food friend, Jodi Ettenberg, told Cowen that Izakaya bars in Japan are some of the best places to get food (and sake). 28) Indian hotels? Most of us have been trained to think hotel restaurants are not the best place to get a great meal, especially in an ethnic country. On the contrary, Cowen says he’s had some great meals at hotels in India. The chefs are usually local and have access to the necessary ingredients and staff. 29) Head to Corleone Country. Sicily is Cowen’s favorite place to eat in Europe. The blend of European, Arabic and Medieval makes the food standout from other countries. I’ll leave you with a quote from Cowen, which I think sums up the book and certainly our mindset when we travel or are just looking for a great experience in Philly. Eating out in a different country is not about the food, it’s a quest. It’s a chance to create an adventure or a memory or connection to local culture. Eating is creative art. P.S. I'm a junkie for books, e-books, articles, essays, etc. on food, farming, the food system, cooking, etc. I thought I'd start sharing some of my favorite reads on the blog, which is the genesis for this post. Please share with me any books or articles you think I should read.